# Tagline: We Will Make Everything Metal! # Plot Synopsis: Dethklok is the biggest, baddest, and most famous heavy metal band in the world. The quintet, consisting of Americans Nathan Explosion (vocals), William Murderface (bass), and Pickles the Drummer, along with Scandinavian guitarists Toki Wartooth and Skwisgaar Skwigelf, have to deal with their fame and other situations in their lives, all the while being monitored by a government organization out to destroy them. Last edited by Macabria on Sun Dec 02, 2007 2:10 pm, edited 1 time in total. 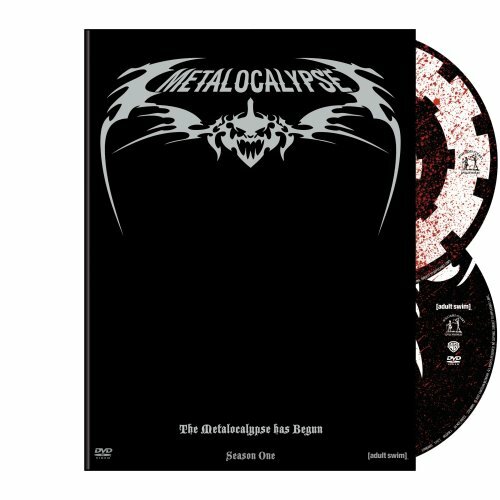 Aqui tienes este disco de los Dethklok de la serie animada en flash Metalocalypse,la primera vez que la vi me enrollo bastante,de momento os pongo el disco y la semana que viene os pondré los dvd's completos de la primera temporada con subtitulos en castellano y frances,el audio en inglés por supuesto,espero que lo disfruteis tanto como yo.Saludos. Location: Under the waste outflow of a reactor core. Season 2, episodes 4,5 and 6.
how so? most eps pop-up the day after it airs right? are those(16-17) the last ep's of the 2nd season?